i recently came upon a sale of many books on ww1 aircraft this series i have seen online and some guys have referenced them. how many were there. i have 1 thru 6 were there more? actually not realizeing it until later i got 2 on the bristol fighter. any brisfit fans out there? they seem to have quite a nice selection of period photos. I only have three, and of course one's the #4 (Bristol Fighter). I'd buy others in a heartbeat as they are full of great quality photos that I've never seen elsewhere. My others are #10, Nieuport Aircraft of World War One and #2, The German Army Air Service in WWI, and they too have some great photos. 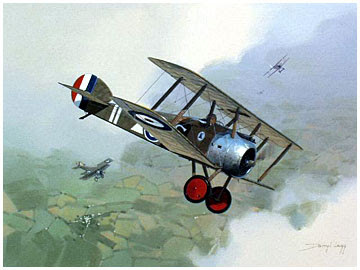 #10 is the Nieuport one above by JM Bruce. I believe all of mine were found in a second hand book shop many years back; my Nieuport one has a pencilled price of $1.00 on the inside front cover, now that's "bang for the buck"!! thanks gents . i will try to find the others as i like to complete series like this. does anyone want my duplicate #4 bristol fighters? i will drop it in an envelope for anyone who wants it with my compliments. Excellent information, I have some odd vols. from both sets, and now know what to find. Wasnt there one on airships too?